Cancer of the spine is the type of cancer, which the causes are largely unknown. Although scientists found that genetic conditions, may contribute the occurring of tumor in spinal column, they still not able to define most of the actual causes and risk factors of spinal cancer. Few risk factors defined are prior history of cancer (including the cancer may spreading to the spine), compromised immune system, hereditary disorders (including neurofibromatosis and Von Hippel-Lindau disease), and exposure to radiation or industrial chemicals. Symptoms of spinal cancer may not noticeable until the cancer grows to the late stage. It develops slowly for years. In different times, the symptoms develop very quickly even within days. The most noticeable symptom when tumor occurs and pushing nerve ending or causing instability in the spine is pain. The tumor may also push the spine and disturb the lining to cause posture change such as hunchback. When cancer of the spine grows strong until it presses the spinal cord, the noticeable signs could be tingling in hand and feet or numbness. When it develops, the symptom may grow into clumsiness, weakness, and even paralysis. It would be hard to do many things, even urination and bowel activities. Similar with other cancer types, accurate diagnosis is imperative before the doctor could determine the right treatment for spinal cancer. In most hospitals and cancer centers, a team of cancer experts will use several tools and imaging technologies to test and evaluate tumors that occur in the spinal column and spinal cord, including angiography, lumbar puncture, and nuclear medicine bone test. 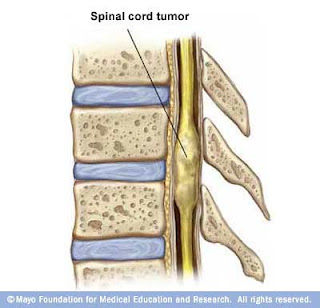 Once the team confirms cancer of the spine and made accurate diagnosis of where, what, and how much the tumor has grow, the treatment plan would be made. Treatment plan would be tailor made based on individual approach due to complexities of the cancer. The choices of advanced medical treatment for cancer of the spine are including surgery, chemotherapy, radiation therapy, interventional radiology, and targeted therapy. The last one is the newer therapy, which targeted the tumors while minimizing side effects. Along with the treatment, the team will also prepare pain management and rehabilitation to preserve mobility and cognitive skills.